All saint's oils have always intrigued me, but always left me disappointed. The oils sold never seemed to be any more extraordinary or that different from all the other oils out there. If it's supposed to be an oil powerful enough to petition all saints and attract their help, it must be pretty unique and potent stuff, right? Well, I think this oil is;) It is created with an "set" oil base to which tonka beans and myrrh resin were added and let set for 2 months. The following oils were then added; vanilla, sandalwood, cinnamon, gardenia, lavender, lily of the valley, frankincense, neroli, and jasmine. 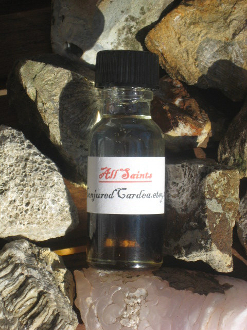 This formula has taken years for me to perfect, as I wanted it to not only appeal to the saints but to those who want to wear and use it as well. It's a wonderful, rich, balanced scent sure to bring a little luck and blessings into your life. It can be used with any saint for any purpose. Please shake well before using as the tonka bean's oil is rich and may settle.